While I was walking through the produce section the other day, I noticed some gorgeous kale with bright purple veins, beautiful in contrast to the bright green leaves! I had to buy some...I wasn't sure how I was going to use it at the time, but I thought it would be delicious however I decided to prepare it. 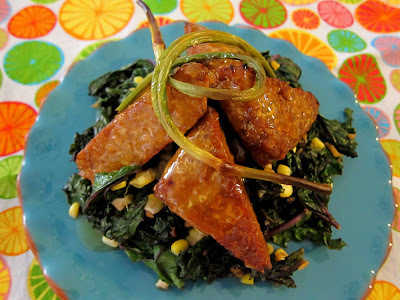 I had also picked up some sweet corn, and last night I decided that I could combine the two in an ginger garlic saute to accompany some roased tempeh cutlets. I used a simple marinade for the tempeh, and then topped it off with a nice citrus sauce to brighten it tup and make it extra tasty. Some garlic scapes that I happened to have on hand made it onto the plate as well, roasted...my favorite way to eat them! Altogether, it was a very satisfying summer meal, taking advantage of the marvelous summer produce available this time of the year! 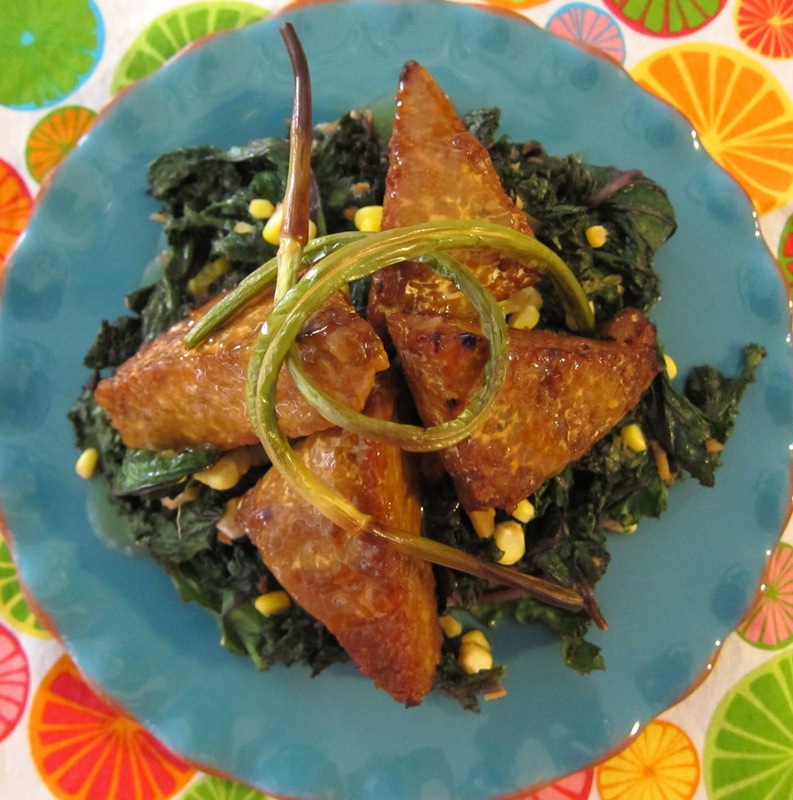 Try it out, and if you can get some local kale, even better! In a medium bowl, combine marinade ingredients and whisk to blend. Add tempeh to bowl, and toss to coat. 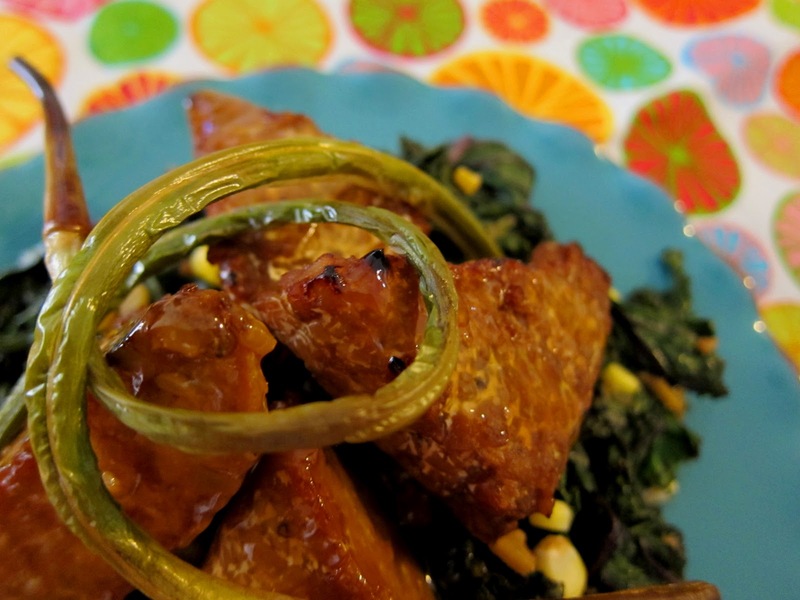 Let the tempeh sit in the marinade for at least an hour, flipping a few times to make sure it soaks in on all sides. Meanwhile, to make the citrus sauce, whisk about 2 Tbsp orange juice into the arrowroot and ginger in a small saucepan. Whisk in the remaining ingredients and set heat to medium. Cook until mixture thickens, then remove from heat and add a pinch of sea salt if needed, set aside. Preheat the oven to 450 degrees, line a baking sheet with foil, and spray with non-stick spray. Lift tempeh out of marinade and place on baking sheet. Sprinkle with a little sea salt, and bake for about 15 minutes until browned and crisp. Meanwhile, to make scapes, line a baking sheet with foil and spray with non-stick spray. Spread out scapes on sheet, and spray with spray to lightly coat. Roast with the tempeh on a different oven rack for about 10 minutes until browned and crispy. Meanwhile, in a large non-stick pan, heat 2 Tbsp peanut oil. Add garlic, ginger, and red pepper and saute until fragrant, about 1-2 minutes. Add the corn and kale, and cook until kale is just wilted, but still bright green. Add the tamari, and mirin and toss to coat. Add sea salt if needed. Remove from heat, and keep warm until tempeh and scapes are finished baking. To plate, divide the kale mixture between 2 plates, top each with tempeh, drizzle with a bit of orange sauce, and top with the scapes in a decorative fashion. Nice Amy! I just bought some tempeh the other day-it was interesting. I have mixed feelings about it, but I'm sure yours was delicious. And I just love kale-yummerz! I love the depth of flavors here. I'm trying to learn new ways to use tempeh, so thanks!